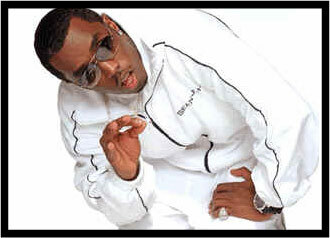 Sean P. Diddy Puff Combs offers tips on fatherhood from the confines of a black rectangle which is slowly crushing him to death. A baby is stimulated by love. Have someone from your entourage say love things to your baby. When you the daddy, you got a responsibility if the court says so. A child’s love is like a rectangle that’s slowly crushing you to death when you’re in your pajama suit. The more you ignore that love, the more it closes like a collapsing rectangle – wrinkling your pajama suit and making you dead. Your baby looks up to you. Be a role model. Keep him from reading the news if you in it. When you make a baby with a woman, half that baby is you and half that baby is her. Can you believe that? If a black rectangle is doomed to collapse into a singularity, you best not let your friend Janeese tell you to go stand in that black rectangle. The happiest children live in a home with a mommy and daddy, but the happiest daddy lives in a home with a lot of mommies. Sometimes you got to make a decision. If people accuse you of being a bad father, just talk all over them like you was recording an album over someone else’s album. Wear sunglasses all the time. That way your child can’t see your eyes and thinks you’re looking at him. When your lungs are being compressed by a black rectangle, take quick breaths like some random woman having your baby.